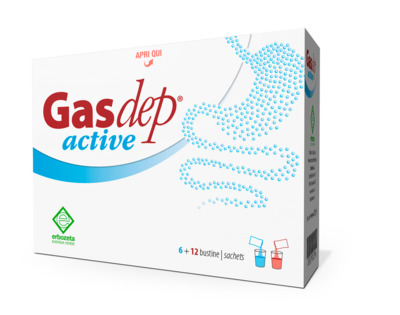 GASDEP® ACTIVE is a food supplement with plant extracts, enzymes and milk ferments. Fennel, Mint, Ginger and Star Anise extracts are useful to favour digestive functions and physiological gastrointestinal motility as well as gas elimination. Milk ferments foster the balance of the intestinal bacterial flora. Beta-galactosidase (lactase) improves lactose digestion in individuals who have di culties digesting it. Alpha galactosidase fosters the absorption of complex carbohydrates in food reducing fermentation processes and preventing the formation of gas. Red sachet: Fennel, Enzymix fermented, Betagalactosidase, Mint, Ginger, Star anise, Alpha-galactosidase. Blue sachet: Lactobacillus Acidophilus, Bifidobacterium Lactis. The recommended dose is one blue sachet dissolved in a glass of water in the morning on an empty stomach; take 2 red sachets a day, 30 minutes before lunch and dinner.